Already breaking box office records as the second highest grossing non-English language film ever, Olivier Nakache and Éric Toledano's The Intouchables has become a worldwide sensation. 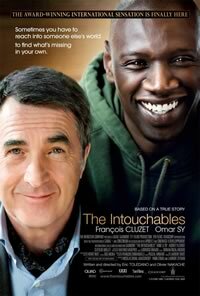 Nominated for nine César Awards (France's equivalent to the Academy Awards), and winning Best Actor for Omar Sy (beating The Artist's Jean Dujardin) The Intouchables tells the story of the improbable friendship between Philippe, a wealthy quadriplegic, and Driss, a young offender of Senegalese descent, who is hired as his live-in caregiver. A widower, Philippe lives with his teenage daughter in a luxurious Paris apartment. When a paragliding accident leaves him paralyzed from the neck down, Philippe requires a caregiver to assist him with his daily physical needs. With the help of his assistant Magalie he interviews a number of highly qualified candidates, all of whom he subsequently rejects in favour of Driss, a recently released ex-con who has only applied for the job to ensure he keeps getting welfare payments. Charmed by Driss's brash self-confidence and sometimes brutal straightforwardness, the jaded Philippe finds the young man’s lack of pity precisely what he wants in a caregiver. Thus begins an unlikely pairing which will change both their lives in a remarkable ways. Propelled by Sy's charismatic performance, The Intouchables is well-executed and thoroughly enjoyable culture-clash comedy about a friendship that transcends the social and economic divide. Based on a true story, writer-directors Nakache and Toledano add just enough real-life seriousness to anchor their narrative, but this simple yet elegant film never loses its sense of humour.